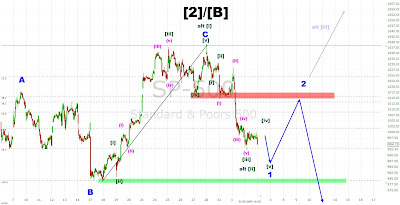 Technical Analysis and Elliott Wave Theory: The beginning of the end? Already on Monday the SPX fell below 1016, what I considered to be a first indication that the bear market rally is finished. The next very important support lies at 979, the low of Minor B. I expect this level to be tested to finish the first wave down. Afterwards a wave 2 should occur, possibly to challenge the resistance at 1018. This rally should be a great short opportunity (with a stop at 1039). EWI: You might have already seen all the EWI Banners which will be decorating my blog from now on. Last week I recieved an e-mail from an EWI employee. He wrote that they are interested in working with me. I accepted of course and so, from now on, I'm an official affiliate of Elliott Wave International : D.
I can highly recommend all the free stuff they provide. If you haven't read yet Prechter's 10-page letter (it expires in a week), just click on the first banner in the sidebar on the left to be able to read it. If you aren't a member, just sign up (it's completely free). EUR/USD: It breached the support line of the rising wedge and will possibly test it from below later this week. Another 50 points to the upside?